Super easy -- great for breakfast or dessert! Gosh it has been awhile since I’ve posted a recipe. And I must say I’m very happy to get back in the groove by presenting you with this super easy recipe for Caramelized Banana Topping. For breakfast, this topping is perfect spooned over tender buttermilk pancakes. In the evening, toss another little spoonful over some vanilla ice cream to wrap up your day. Bananas in the beginning; bananas at the end. Banana bookends! Caramelized banana topping is a perfect topping for pancakes or even vanilla ice cream. Easy and fast to make. Caramelized bananas -- you need them now! 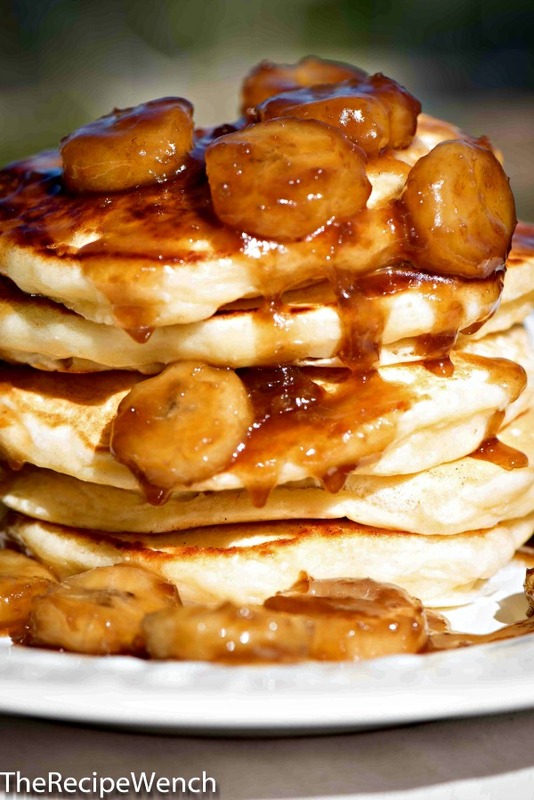 Caramelized banana topping is an amazing substitute for syrup on pancakes. A nice spoonful of warm topping over vanilla ice cream is super yummy too! In large skillet, melt 6 tablespoons butter over medium heat. Add 1/2 cup brown sugar and stir until combined. Add 2 sliced bananas, stirring gently and flipping banana slices so they don't burn. Continue to cook until butter/sugar mixture starts to caramelize. Remove from heat and stir in 1/2 teaspoon vanilla extract.